The restored facade of the church. The Jesuits’ Church in Valletta has been restored to its glory following a €600,000 investment. The church was built together with the Old University and had sustained damages following an explosion in 1634. Francesco Buonamici, the resident military engineer of the Order, was put in charge of restructuring and enlarging the church. He transformed it in a more illuminated and decorated space and rebuilt the façade overlooking Merchants Street. Works related to the roof included interventions on the dome, the belfry, large areas of the roof screed, and on the side cupolas that were severely deteriorated. The works included changing the masonry, pointing works, the consolidation of deteriorated stones as well as the re-building of one of the lanterns and the restoration of roof screed in some areas of the roof and the dome. The façades overlooking Merchants Street, Archbishop Street, and St Paul Street have also been restored. These were characterised by a thick layer of dirt that accumulated through the years. There was damage to the masonry and signs of movement in the corner of Merchants Street and Archbishop Street. Interventions were also carried out on the apertures on all façades. The works were carried out by private contractors under the supervision of the Restoration Directorate within the Culture Ministry. Works on the façades of the church entailed interventions on more than 2,100 square metres of walls. 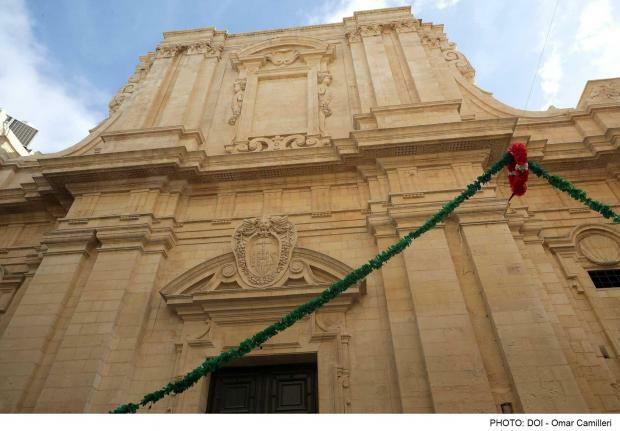 “The Jesuits' Church is one of the symbols that represent our country’s rich history and we are doing our best to excel in the preservation of such symbols,” Culture Minister Owen Bonnici said.